This post is written in honor of my SCIENCE FUNDING SUPERHERO, Eli Stickgold. Eli contributed to my #SciFund proposal, and is helping to support my zombie fish research. Eli teaches middle-school and high-school aged students about parasite manipulation, and he requested this article so he can teach his students more about ZOMBIE ANTS. Parasites aren’t particularly good at traveling great distances on their own. Free-living stages are often too small to get very far, and parasitic stages are forced to go wherever their hosts go. Lots of parasites have solved this dilemma by doing what I like to call zombifying their hosts. What I mean by this is that they get their current host to take them where they need to go, often with massively detrimental consequences for the host. By massively detrimental, I’m talking death. One of the best examples of parasites zombifying their hosts (or “parasite behavioral manipulation”) is seen in ants and their fungal parasites. The fungus known as Ophiocordyceps unilateralis starts its life on the ground. Here it waits for an unsuspecting ant (for example, Camponotus leonardi) to wander down from the canopy of the rainforest and walk over it. Now this isn’t something that canopy ants often do. They tend to avoid descending from the trees, and seem to move to the ground only when they are unable to find a path from one tree to another up in the canopy (e.g., if they can’t find branches from one tree that touch the branches of a nearby tree). If one of these ants is unfortunate enough to accidentally contact the fungus, then the fungus works its way inside of the ant and begins to grow. This ant is now on its way to becoming a zombie, and in a few days it’ll be done for. The fungus’ next big task is to reproduce. Fungus “offspring” are called spores, and these spores are best produced under particular environmental conditions (e.g., particular temperatures and humidities). The fungus parents who are the most successful are the ones whose spores are released in an area where the spores are likely to encounter homes (hosts) of their own. Unfortunately for the fungus, the canopy where the ant lives is not an ideal location to produce and release spores. To solve this problem, the fungus turns its ant host into a chauffeur, manipulating the ant into bringing it to a location ideal for spore production and dispersal. The first step for the parasite is to get their ant host out of the canopy and moving towards the forest floor. Infected ants begin walking around randomly, as though they were drunk. This drunkard’s walk (which is actually a somewhat technical mathematical term describing a type of random movement!) is occasionally interrupted by convulsions, which send the ants falling towards the ground. After all this walking and falling, infected ants settle down on a leaf approximately 25 centimeters above the forest floor. When they reach this point, the ant’s mouthparts (called “mandibles”) clamp down around a vein on the leaf, and there the ant will remain for the rest of its life and beyond. So, why here? Why 25 centimeters above the forest floor? Amazingly enough, this location appears to be picked because it is the optimal location for the fungus to reproduce. Experimentally moving infected ants closer to the forest floor resulted in ant hosts disappearing (presumably they were eaten by scavengers) or getting covered up by debris (like leaves and sand). Experimentally moving the dead infected ants up caused the fungus to grow abnormally, likely because conditions for growth (for example, temperature and humidity conditions) were suboptimal. High rates of fungal death outside of this zone 25 centimeters above the forest floor likely resulted in strong selection pressure on the fungus to exert specific control over the behavior of its ant host, and the fungus is now amazingly good at manipulating its host into taking it to exact locations that are optimal for survival and reproduction. 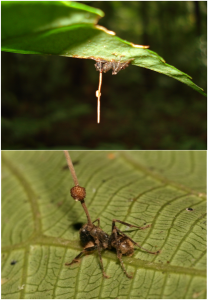 Almost as amazing at the fungus’ ability to drive its zombie ant host to a very particular location is its ability to get the ant to clamp onto the leaf and stay there. The ants always move to the underside of the leaf, and nearly all of them bite down around a vein. This bite is called the “death grip” (such a great scientific term), and after the ant bites down it will never again release its hold on the vein. Although the ant’s mouthparts work normally leading up to the death grip, dissections of ants after the initiation of the death grip reveals that the muscles controlling the mandibles have been depleted of their energy and have begun to break down. The fungus is able to get the ant to chomp down and then removes the ant’s ability to ever use the mandibles again. A few days later, a fungal stalk bursts out of the ant. This is the most photogenic stage of the parasite. Spores will eventually burst out from this stalk, and will rain down onto the forest floor where the cycle begins again. For how long have zombie ants walked this planet? One of the difficult parts of studying parasites or behavior is that neither preserve very well in the fossil record. Parasites are often soft-bodied, and therefore don’t lend themselves very well to preservation. As you can imagine, behaviors (generally a property of only living organisms) are also difficult to study using fossils. You know what does end up in the fossil record fairly often? Leaves. When the ants bite down in their death grip they leave distinctive puncture marks along the veins of the leaves. To see death grip photos from recent and fossilized leaves check out page two of this paper. Researchers have found fossilized leaves containing these distinctive death grips, and dating these leaves allows us to estimate that zombie ants have been roaming the planet for at least 48 million years. This puts zombie ants in the Paleogene, a time period when most of the major mammal groups present today were starting to appear on the scene. Long before humans roamed the planet, and long before humans began to understand connections between the brain and behavior, fungi were manipulating the behavior of their hosts to meet their own needs. Especially because this may be getting read by middle-school and high-school students, I feel compelled to point out that you’re guilty of a little too much over-personification here, i.e. ascribing “knowledge” to a fungus (“The fungus knows where the best locations for reproduction can be found” and “fungi had figured out …”). The fungus doesn’t know anything. Evolution (probably co-evolution of the fungus and the ant, and possibly of some of the leaf-bearing plants and maybe some other parts of the ecosystem) has resulted in an effect on the fungus-infected (infested? affected?) ant which causes it to stop at that location, but that’s not because the fungus “knows” anything. One might argue about whether evolution “knows” about this, but if we’re going to have that argument, we should do that inside a Chinese room. Thanks a lot for your comment. I’ve made changes to the post that I think make it clear that evolution is the driving force behind this manipulation. Morris, you are right that we must be careful not to anthropomorphize, however in this case I don’t think it is necessarily anthropomorphic to use the term “know” in relation to the parasite’s inducing the host to arrive at a particular location. 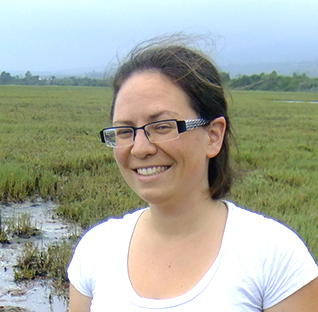 The host/parasite necessarily have perception of environmental characteristics that allow them/it to differentiate between ~25 cm elevation and other elevations. When the perception of elevation matches a pre-coded perceptual trigger, the host/parasite reacts accordingly. That really does seem to me like a fair description of “knowing” that they/it have arrived at the gene-satisfying goal. True, it’s not “knowing” the way humans “know” what their favorite flavor of ice cream is, but the term seems broad enough to me to encompass this particular type of response to perception.